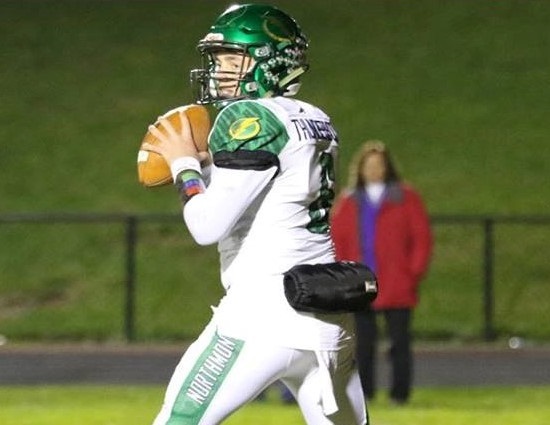 VANDALIA, ohio – Senior quarterback Miles Johnson threw for five touchdowns and ran for another as Northmont remained unbeaten with a road win over Butler. The Thunderbolts quick strike offense had aerial scores of 76, 70 and 47 yards. Northmont is now averaging 39.5 points per contest. Johnson finished the night 12-17 for 322 yards. It was the fourth time in his career that he has thrown at least four touchdown passes in agame. Jazz Keys had games highs with eight receptions and 138 receiving yards. The junior also found the end zone twice. Classmate Justin Golson took both of his receptions to the house and finished with 101 yards receiving. Keys and Golson have combined to catch 30 balls for 586 yards and 10 touchdowns this season. Mason Motter threw for 99 yards and ran for 52 more for Butler. The Aviators senior also had a touchdown rushing and one passing.